Heat oil in a pan. Add in chopped ginger, garlic, gr. 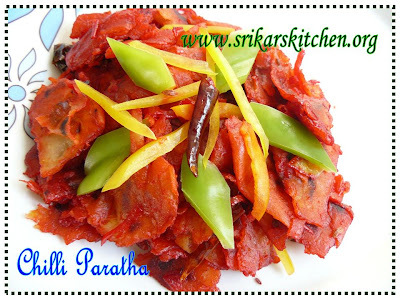 chillies ,red chilles & onions & allow it to saute for few minutes. Add in the tomatoes & allow it to cook until all the water evaporates & the mix is thick. Add in the peppers(capcicum) & allow it to sweat. Add all the sauces & cook until the raw flavour extracts. Once the gravy is cooked & almost moist add in the peeled paratha & mix well. Wow,Lovely,new recipe to me.Looks hot and spicy and mouthwatering. Looks great Priya. I like spicy food. new recipe to me too.. saptadhe illa.. but paaka supera iruku. I had in restau but very heavy one! I too make this with frozen parata,urs looks so colourful and tempting! Wow i have never ever seen such a delicious looking chillie paratha. I would love to try this, if there was actually such a thing as a left-over paratha in my house... Looks tasty! WOw Sri..this is not fair..pasikura madhri recipe podalama...pakkave semaiya irruke.. I used to eat this almost everyday when I was back home. I love it. Your pic is just amazing. Check out my site too.. I luv this recipe. Thanks for sharing.